When fasting, Hindus can not eat anything containing cereals .My Mom,who fasted at least twice a week, used to make Halwa with either sweet potatoes or ordinary potatoes. It can be eaten at the time of Navratri fasting also.It tastes good and delicious with either. 1) Boil Sweet potatoes with their skin in pressure cooker or Sweet potatoes can also be boiled in a microwave. 2) When cool, peel and mash sweet potatoes. 3) Heat ghee in a Pan. Fry cashewnuts till they become golden brown. Then add raisins & fry for few seconds. 4) Heat 1/2 tsp ghee in a pan and then add mashed sweet potatoes & fry well. 5) Cook till ghee starts oozing out. 6) Add sugar & Mix well and cook for 5 more minutes. 7) Remove from heat and garnish with rasins and fried cashewnuts. 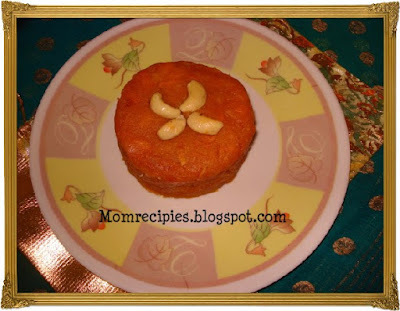 Your yummy sweet potato halwa is ready to eat. nice and new recipe.We make curry with swet potato by adiing jaggery to it. This looks yum. Your halva looks nice. I never had a halva made of potato. My favorite is Gajar ka halva that my mother prepares. 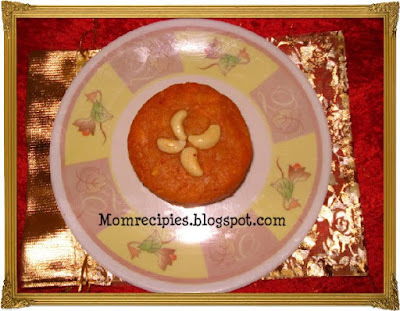 Never thought of making out halwa with sweet potato, looks delicious..
What a great idea to use sweet potato. Looks yummy! I didn't even know we could make halwa like this, looks yummy sweety and love the colour. wow I make payasam with sweet potato but halwa is new to me looks so delicious will try and let you know. I never tried halwa in sweet potato. i will try soon.Delicious one.